In a bowl or heat-resistant baking dish, combine milk, vanilla and brandy. In blender, blend condensed milk, evaporated milk and lemon juice for 3 minutes. One by one, take the María cookies, dip them into the milk, brandy and vanilla mixture for several seconds, making sure the milk covers cookies completely. Do not leave cookies in milk mixture for too long, or cookies will soften and break apart. Place one layer of cookies on bottom of baking dish or tray until it’s covered, and place several cookies around edges of tray as well. Pour a third of the milk and lemon juice mixture over the layer of cookies on the bottom of the baking tray. Dip cookies into milk mixture again and place another layer; then a layer of the milk mixture, repeat once again; end with a light layer of milk. When you’re done, you will have a total of three layers of cookies and three of milk. Place in refrigerator for at least 5 hours. You can garnish your pavé right in the baking tray with a layer of grated coconut and several lemon wedges. You can also unmold it, place it on a platter and garnish. Unmolding is easier if you line with a layer of waxed paper prior to adding the first layer of cookies. If you make this dessert the day before, it will be firmer and the flavors more intense. You can also use ladyfingers instead of cookies. This delicious recipe not only creates an exquisite combination of two tropical flavors – lemon and coconut – but it’s also very easy to make, and doesn’t need to be baked. In Brazil, they call it pavé, which would translate as cobblestone or brick; and in the culinary world, it usually refers to square- or rectangular-shaped dishes. 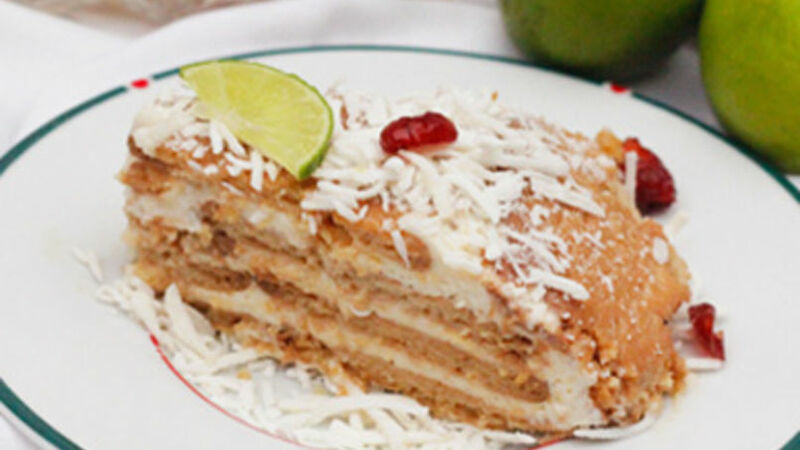 In Brazil, where pavé is a very popular dessert, it also refers to desserts made of layers of cookies and either fruit, chocolate or cream that can be either square- or round-shaped. Let’s get to it!